A very strong 3.5+ stars, which I’m rounding up to 4 because I enjoyed it more than other recent books I’ve given 3 stars to (damnit GR, give us ½ stars or more of them to play with!). 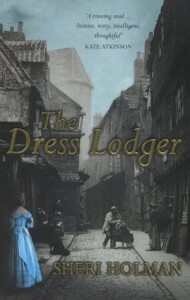 The Dress Lodger takes place in 1831 in Sunderland, an industrializing seaport on the northeast coast of England, as cholera gains its first foothold in the kingdom. It’s a decidedly grim novel, uncompromising in showing the desperate and dehumanizing poverty of the city’s denizens, and the callow and callous indifference of the better off. Gustine: Gustine is the “dress lodger” of the title. (A dress lodger is a prostitute who rents a fine dress to attract a better class of customer.) She’s the fifteen-year-old mother of a boy who’s born with an ectopic heart – it’s outside his ribcage, protected only by the skin and muscle of his chest. Since age nine, Gustine has worked six days a week in a pottery factory, and now to support her son, she walks the streets wearing a dress rented from Whilky Robinson, her landlord and pimp. Her desire to secure a safe life for her child seems within reach when she meets Dr. Henry Chiver. The Eye: The Eye is Gustine’s “shadow,” hired by Whilky to follow the girl so she won’t steal the dress. An ancient, one-eyed hag, The Eye becomes the focus of Gustine’s hatred, anger and fear for her child’s life as she believes the old woman is responsible for the baby’s deformity and wants to finish the job started at his birth by killing him. Dr. Henry Chiver: Chiver was a student of Dr. Knox, the Edinburgh physician who benefited from the murderous acquisitions of Brendan Burke and William Hare, serial murderers who provided doctors with bodies for dissection. His reputation ruined, Chiver has moved to Sunderland, where his fiancée’s uncle, also a doctor, lives. Circumstances conspire to bring Chiver and Gustine together one night where he tells her of his need for bodies and she realizes he could be the means to save her baby. Audrey Place: Audrey is Chiver’s fiancée. She’s only a couple of years older than Gustine but her life has been comfortable and fenced off from the horrific conditions most Sunderlanders live under. Intelligent but naïve, her innocent charitable efforts have far reaching and tragic consequences. Whilky Robinson: Robinson is the ignorant, brutal landlord of 9 Mill Street and Gustine’s pimp. He’s a pretty despicable character and it’s not easy to muster much empathy for the man but Holman avoids making him a cardboard villain. Pink: Pink is the eight-year-old daughter of Robinson, called so because she has conjunctivitis, and her reddened eyes constantly weep tears and pus. The story is told in a gently sardonic, third-person omniscient voice that we learn toward the end is the collective voice of the dead poor who fill the paupers’ graves of Sunderland’s churches. I enjoyed the book. Perhaps because – despite it’s depressing subject and depraved plot – hope remains. Gustine and The Eye achieve epiphanies of understanding and compassion that lift them above the self-centeredness and/or apathy of their neighbors. There’s no happy ending but they are better people for what they’ve endured. 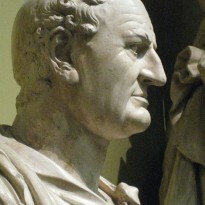 “‘If it were for the greater good, I would so willingly,’ he says. I don’t have a problem believing that an uneducated, fifteen-year-old girl could intuitively grasp such a concept but I don’t think an uneducated, fifteen-year-old girl could express it so eloquently and assuredly. In this case, I think the author’s voice displaced the authentic voice of her character. But aside from that minor discordance, I very much liked The Dress Lodger and would recommend it.